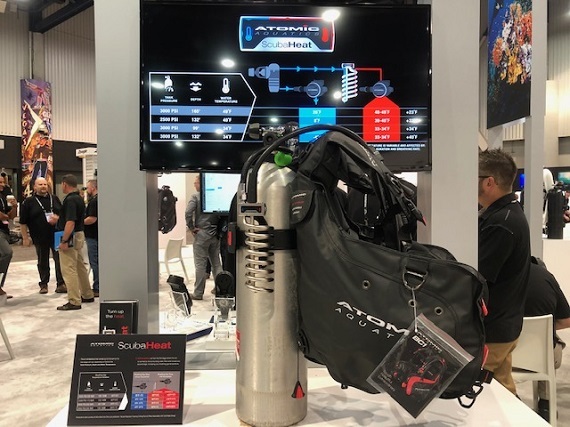 Atomic Aquatics has unveiled an industry-first air warming system called ‘Scuba Heat’ at the 2018 DEMA Show in Las Vegas today. Scuba Heat promises to make cold water diving much more comfortable, safer and of longer duration by warming your core body temperature. It’s an effect experienced by rebreather divers who breathe their own exhausted warm air in a loop. Up to now, open circuit divers haven’t enjoyed the same benefit. 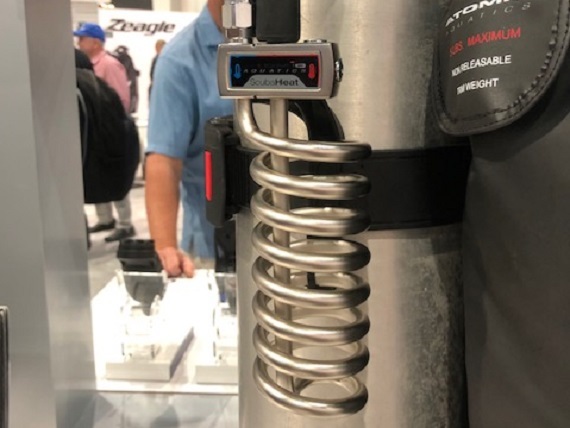 The system is mounted on a cylinder’s tank band, and connected to a regulator’s first stage by a high pressure (HP) hose. Air exits the regulator first stage, passes through the coil and is warmed by the surrounding water, before entering the second stage to be breathed. High-end manufacturer Atomic says the system can raise a gas temperature of minus 21 degrees C up to 1 degree C.